blind men and elephant fish 맹인들과 코끼리 물고기: We're doing SASSE! As part of our research at The Maru we monitor the water quality of three local rivers; the Kande River, the Masembe River and the Fua River. This month, alongside collecting data on water temperature, current, turbidity, pH and TDS (total dissolved solids), we have introduced a Stream Assessment Scoring System (miniSASS) to our water quality monitoring. This is a tool used to monitor the health of a river and measure the general quality of the water. 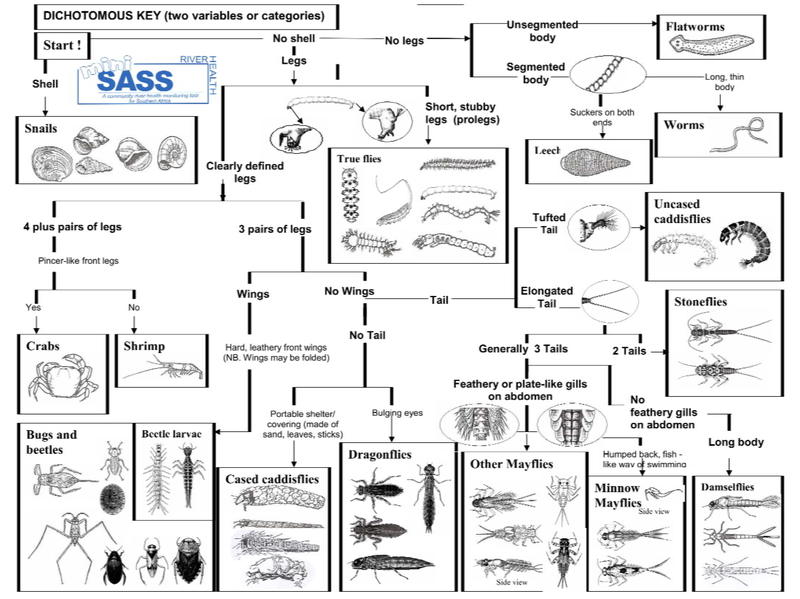 MiniSASS scores the sensitivity to water quality of various macro-invertebrates living in rivers and classes the health of the river using five categories ranging from natural to very poor. At each site a small net is held in the current. Whilst ranging across the river to different habitats; stones, vegetation, sand etc. are disturbed using your feet or hands. After five minutes the content of the net is emptied into a white tray filled with some water. 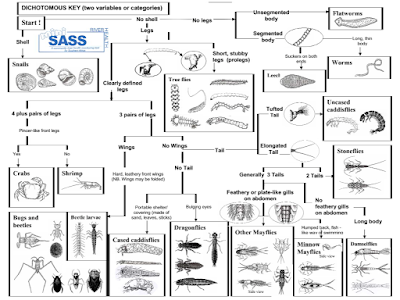 Using a magnifying glass, each insect is studied and identified using the dichotomous key (Figure 1). We are not concerned with the number of insects; we are simply interested in the presence or absence of a group. Each group found scores a certain number based on its sensitivity (Table 1). The sum of the sensitivity scores for each group found at the site is then divided by the number of groups to give an average. This average score is compared to the Ecological Category Table (Table 2) which tells us which health class the river is in. Whilst this water quality monitoring technique is still very new for The Maru, we have already found some interesting results. So far all of our sample sites fall in the ecological categories between unmodified (natural), and largely modified (poor condition). 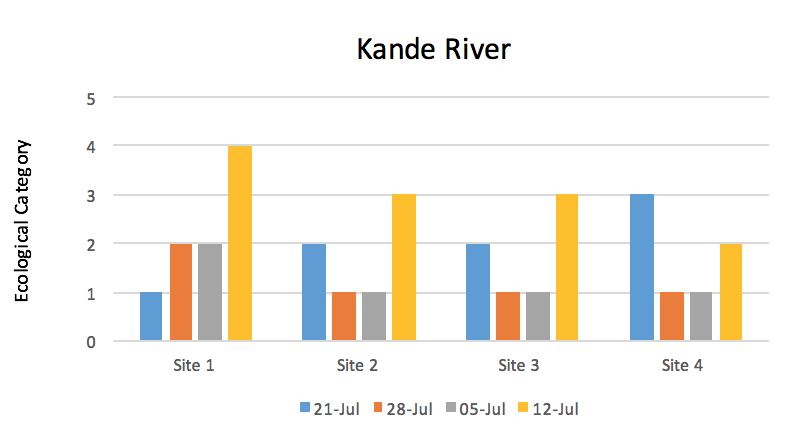 For examples as Figure 1 shows, the health class of each site along Kande River has varied from natural to poor within 4 weeks. More data is needed in order to see if this will stabilise and how conditions may vary seasonally. However, it is good to see that the majority of the samples (75%) are either ‘natural’ or ‘good’ and a smaller proportion of the data (25%) fall in the ‘fair’ and ‘poor’ categories. Figure 1. Graph showing the health class of 4 sites along Kande River over 4 weeks where an ecological score of 1 is ‘natural’, 2 is ‘good condition’, 3 is ‘fair condition’, 4 is ‘poor condition’ and 5 is ‘very poor’. Our data will be uploaded onto the miniSASS website (www.minisass.org) in order to help map river health across Southern Africa. Once more research has been done using this method, communities can use the information and knowledge of the rivers to investigate why the river is in good condition and how to keep it that way or to identify pollution sources in areas of poor condition. Locals are already very interested and curious and enjoy learning about what we are doing and having a look at the insects we find.